Officials are proposing to turn a blind eye to the failure of the operators of the Spark container village to implement planning conditions. Instead a report to a planning meeting next week recommends that retrospective planning permission be given to ignore previously imposed conditions. Even the burgeoning academic city elite have managed only a handful of comments in favour of Sparks application. The development currently majors on alcohol-based businesses, omits promised wooden screening, includes a “graphic” on its Piccadilly frontage which is intrusive (at least) and has no proper disabled access. There are several reasons why this approach will create dangerous precedents. The Council is the owner of the site and is Spark’s landlord. If the enterprise fails, then the Council (taxpayers) will be out of pocket. Officials and councillors on the planning committee cannot inure themselves from this unfortunate fact. Their impartiality is compromised. Failure by the Council to insist on proper disabled access being available from day one of operation is a dereliction of duty and lets down an important, vulnerable section of the local community. If the operators of any other commercial shopping development in the City, not on a Council owned site, had tried that on, then they would likely have received an enforcement notice the next day. “Can’t afford to implement the planning conditions” is not a reason to change them. Other developers will quote this precedent if retrospective planning permission is granted. The planning official’s analysis of the application is disappointing. It agonises about the impact that the buildings and the street art have on the Red Lion (Listed Grade II) and St Deny’s church (Listed Grade I). Officials make the subjective judgement that the development “causes less than substantial harm to the character and appearance of the Conservation Area”. The impact of the development, acknowledged by officials as “a far more utilitarian development which expresses the structure and appears somewhat cluttered”, extends far beyond the Piccadilly area. The report claims that “commercial units in Spark have been occupied in accordance with the approved scheme and the social space / business hub is used by various local groups and organisations”. In reality, several of the (non-alcohol related) units are empty. Officials claim that the development meets one of the Councils own objectives. “To support strong, vibrant and healthy communities”. How stimulating a drinking culture helps create a “healthy” community is not explained. As its already in place and has a lease until May 2020, the assumption must be that it will stay. The mistake was made when the Council leased the land for such a use in the first place (November 2016). This was compounded by a poorly thought through planning permission. The Planning committee should insist that an enforcement notice is issued immediately requiring the disabled access lift to be installed within the next few days. A temporary closure notice should be issued if this isn’t done. The committee should also insist that the “art” and lettering on the Piccadilly frontage is removed and that the visible container sides are painted in neutral colours. Notwithstanding this, there are questions that the council as the landlord for the site needs to answer. It should be open about the current amount of public investment that is at risk. By now the Councils should have received a significant amount in rent and rates. It should say how much? “I visited Spark on Piccadilly yesterday and noted that there was no access to the upper level for disabled or infirm/old people – two of the protected characteristics identified in the Equality Act 2010. 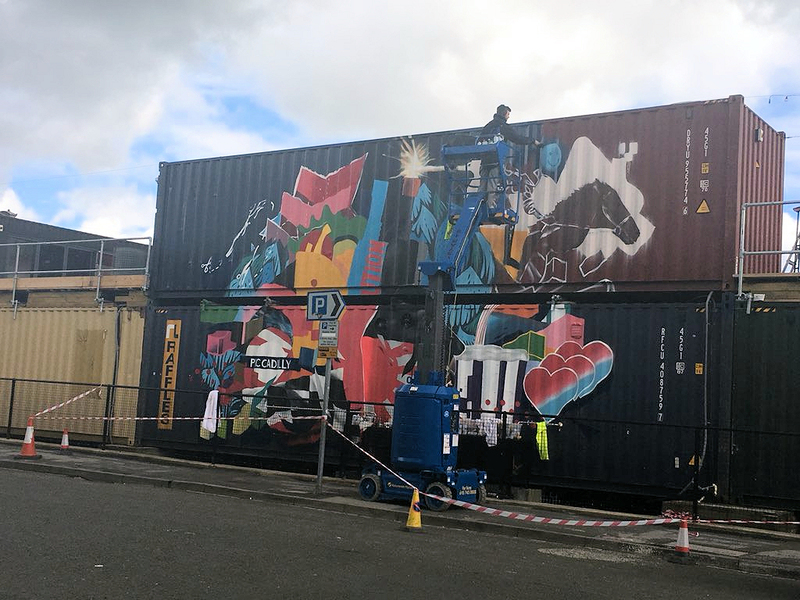 “Since the Spark enterprise is promoted by City of York Council, supported by public money, and occupies CYC land, I expected that all residents would be able to enjoy the experience. As it stands, two of the most socially and economically marginalised groups in society are once again disadvantaged. “The moral position is clear, but what is CYC’s public sector equality duty concerning access to Spark by people with protected characteristics who are currently excluded, please? Andrew Docherty has not replied.